At a press conference in New York, Acer announced the new Chromebook 14 for Work. As the name would suggest this laptop has been designed to appeal to businesses looking to use Chrome OS in its corporate laptops. The new Chromebook will support Chrome for Work program, which will provide enterprise level tools to make it a highly secure device. 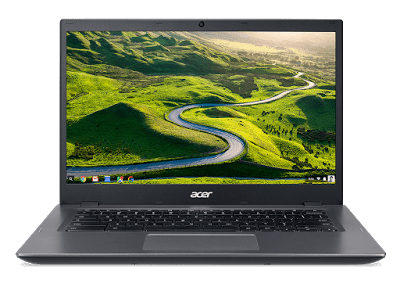 Acer has also bumped up the specs, which will make this notebook one of the most powerful Chromebooks to be available soon. Chromebook 14 is the first to use the 6th generation Intel Core processors a.k.a. Skylake, configurable with upto 8GB of memory (LPDDR3 SDRAM). According to Acer, the new processor will provide a battery life of 10 hours on the full HD resolution. If you are not much of a full HD fan, the battery life will surely improve if you use a lower resolution. The display will come in 2 resolutions – 1920 x 1080 or 1366 x 768 and has a wide viewing angle of upto 170 degrees. To protect the screen (and the laptop), the notebook meets the MIL-STD 810G military standard, which gives it an added protection against drops. Donning a scratch resistant Vibrant Corning Gorilla Glass lid, this Chromebook will not only allow companies to print their logos but also make them look vivid and beautiful since it is printed on a glass surface. Other features include a spill-resistant keyboard, a 720p resolution webcam, 802.11ac Wi-Fi and a USB 3.0 Type-C port which can be connected to a docking station with additional ports. Weighing just 1.45kg (3.2 pounds) and packed with many robust features, the Chromebook surely won't come cheap. Its line starts at $349 in the US and will be available in May. Considering other players in the Chromebook for Work series like HP, Dell and Acer itself, Acer has surely made a pretty good device, in terms of specs, this device surely tops it.